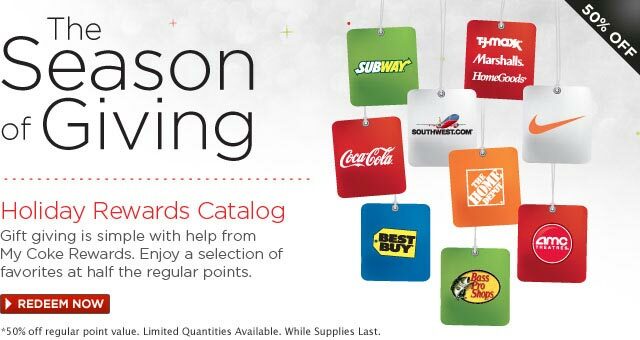 My Coke Rewards currently has its Holiday Rewards Catalog open. This has lots of great rewards available at half their normal point values. You can get a coupon for a free 12 pack of any Coca Cola products for 120 points (half off) and they even have gift cards to restaurants and stores for discounted point values. If you are new to My Coke Rewards, it is a website that you can join for free. You then enter codes from Coca Cola products and you can redeem those rewards for prizes.